One of the most important benefits of orthodontic treatment in children and adolescents is the ability to harness growth to correct problems with the fit of the jaws/teeth. Examples of these problems are 1) posterior crossbites (where the upper jaw is too narrow) and 2) a recessive lower jaw that appears as excessive protrusion of the upper front teeth. As the upper and lower jaws grow, their supporting bone is very flexible and responds well to light forces that help direct that growth. If these types of problems remain uncorrected into adulthood, they would require a surgical procedure to correct since the bones have all fused and matured. Here are two examples of orthopedic devices used at our office that direct growth. A posterior crossbite is present when an upper molar is in too narrow of a position in relation to the lower molar. This causes a problem because the ill-fitting molars cause excessive interferences in the bite and tend to wear down prematurely. 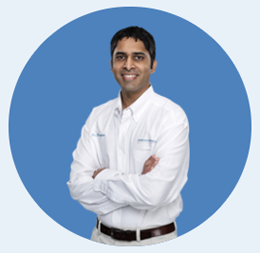 Most people are familiar with rapid palatal expanders as the appliances that get “cranked.” We custom-fabricate our expanders for each patient and thoroughly cover all instructions with activation and hygiene/care when they are delivered. Each turn increases the width of the upper jaw by approximately 0.25mm, so this is a very gradual increase in jaw width. 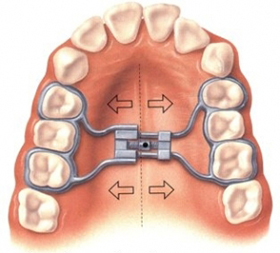 Once the crossbite is corrected, the expander is removed and the bite holds the correction in place. It is quite possible you have heard of or seen an orthodontic appliance called a headgear (especially if you watched “Finding Nemo”). If your child walked into an orthodontic office 15 years ago with protrusive front teeth that rested on the lower lip, chances are they would be treated with a headgear appliance to pull those front teeth back. But if you actually looked at the child’s profile, you would note that it was the lower jaw that was recessive that caused the front teeth to appear so far forward. Therefore, the headgear did not approach the problem at hand, it just masked it by bringing the upper teeth back. 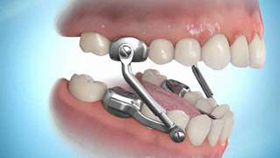 In order to help the lower jaw grow forward, we use a device called the Herbst appliance. It is cemented in place and actively positions the lower jaw forward, immediately reducing the distance between the upper and lower front teeth. We love it because our patients do not need to remember to put it on or wear any rubber bands, it is always active. Once the Herbst has been in place for 10-12 months, then we remove it to place the braces, which stay on for another 12 months. Therefore the Herbst appliance does two things: 1) helps a recessive lower jaw grow forward; 2) reduces the amount of time in full braces. It is so much easier than strapping a headgear on at night!